Our best cheap smartwatch has been discounted throughout the 2018 sales period, but today it's at the lowest price we've seen it in the UK. Mobvoi's TicWatch E is down to £87.58 - we don't know why it's such an odd number - for today only, and you'll be able to grab it if you buy it by midnight December 20 GMT. You can find the link to the deal below, but first we want to show you why the TicWatch E is one of our favourite affordable devices. In our initial review praised the device for its combination of low price while also sporting top-end features like GPS and an accurate heart rate tracker. You can read our full TicWatch E review here. The TicWatch E is the perfect beginners smartwatch for someone who wants something a little more affordable but still most of the benefits of Wear OS software. Note this deal is only for the white version of the smartwatch. 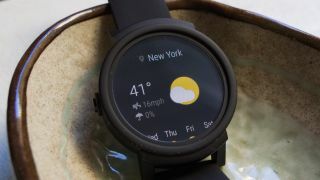 The TicWatch E is the perfect beginners smartwatch for someone who wants something a little more affordable but still most of the benefits of Wear OS software. This deal will allow you to grab the black or yellow versions of the watch through Mobvoi's official site.